A prototype of the holographic memory device built in the lab of Alexander Khitun. A team of researchers from the University of California, Riverside Bourns College of Engineering and Russian Academy of Science have demonstrated a new type of holographic memory device that could provide unprecedented data storage capacity and data processing capabilities in electronic devices. The new type of memory device uses spin waves — a collective oscillation of spins in magnetic materials — instead of the optical beams. Spin waves are advantageous because spin wave devices are compatible with the conventional electronic devices and may operate at a much shorter wavelength than optical devices, allowing for smaller electronic devices that have greater storage capacity. Experimental results obtained by the team show it is feasible to apply holographic techniques developed in optics to magnetic structures to create a magnonic holographic memory device. The research combines the advantages of the magnetic data storage with the wave-based information transfer. “The results open a new field of research, which may have tremendous impact on the development of new logic and memory devices,” said Alexander Khitun, the lead researcher, who is a research professor at UC Riverside. Holography is a technique based on the wave nature of light which allows the use of wave interference between the object beam and the coherent background. It is commonly associated with images being made from light, such as on driver’s licenses or paper currency. However, this is only a narrow field of holography. The first holograms were designed in the late 1940s for use with electron microscopes. A decade later, with the advent of the laser, optical holographic images were popularized. Since, other fields have significantly advanced by using wave interference to produce holograms, including acoustic holograms used in seismic applications and microwave holography used in radar systems. Holography also has been recognized as a future data storing technology with unprecedented data storage capacity and ability to write and read a large number of data in a highly parallel manner. Khitun has been working for more than nine years to develop logic device exploiting spin waves. Most of his initial research was focused on the development of spin wave-based logic circuits similar to the ones currently used in the computers. A critical moment occurred last year when he decided the device didn’t need to replace the computer’s electronic circuits. Instead, the device would complement the circuits, or help them accomplish certain tasks, such as image recognition, speech recognition and data processing. The experiments outlined in the paper were conducted using a 2-bit magnonic holographic memory prototype device. 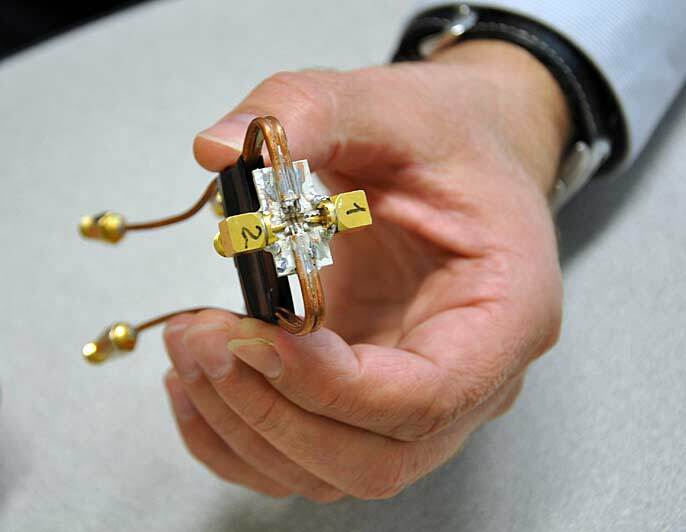 A pair of magnets, which represent the memory elements, were aligned in different positions on the magnetic waveguides. Spin waves propagating through the waveguides are affected by the magnetic field produced by the magnets. When spin waves interference was applied in the experiments, a clear picture was produced and the researchers could recognize the magnetic states of the magnets. All experiments were done at room temperature. A paper, “Magnonic Holographic Memory,” that describes the finding has been submitted for publication in the journal Applied Physics Letters. An advance copy of the paper can be accessed at http://arxiv.org/abs/1401.5133. There are three co-authors of the paper: Frederick Gertz, a graduate student who works with Khitun at UC Riverside, and A. Kozhevnikov and Y. Filimonov, both of the Russian Academy of Sciences. The research was supported in part by The Center for Function Accelerated nanoMaterial Engineering (FAME), which is funded with $35 million from the Semiconductor Research Corporation (SRC), a consortium of semiconductor industry companies; the Defense Advanced Research Projects Agency; and the National Science Foundation under the NEB2020 Grant ECCS-1124714.